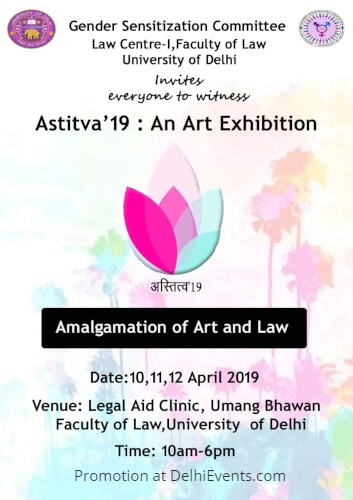 Event Description : ART EXHIBITION "Astitva 2019" An art show and dialogue on 'Gender Sensitization - A Three Dimensional Approach'. Through this event the passionate artists who are pursuing law, express the legal issues on the canvas, making it much easier and artistic. Its a must visit event, also because students have almost fought with the faculty to stand for this event, just because of the love they have for art, their passion. And despite so many hurdles they have stood together and made this event happen.